The Ministry Education programme is visiting the three functioning cathedrals in the United Dioceses of Limerick and Killaloe today [30 April 2018]. In all, the diocese incorporates eight territorial names from ancient Irish dioceses: Limerick, Killaloe, Clonfert, Ardfert, Aghadoe, Emly, Kilfenora and Kilmacduagh. This is a united diocese that spreads through three geographical provinces, Munster, Leinster and Connaught, from Laois, Offaly and East Galway on the banks of the Shannon to west Clare and the tips of the Kerry peninsulas. However, only three cathedrals have diocesan functions today: Daint Mary’s Cathedral, Limerick, Saint Flannan’s Cathedral, Killaloe, Co Clare, and Saint Brendan’s Cathedral, Clonfert, Co Galway. There is one cathedral chapter for all three cathedrals, and the chapter consists of: the Dean of Limerick and Ardfert (Very Revd Niall Sloane), the Dean of Killaloe and Clonfert (Very Revd Gary Paulen), Precentor (Canon Patrick Comerford), Chancellor (Canon Robert Hanna), Treasurer (Canon Jane Galbraith), the Archdeacon of Limerick, Ardfert and Aghadoe (the Ven Simon Lumby), the Archdeacon of Killaloe, and Clonfert (the Ven Wayne Carney), and the Prebendaries of Saint Munchin's and Tulloh (vacant), Iniscattery (Canon Ruth Gill), and Athnett (vacant, but by tradition the bishop). In addition, there is the unfilled position of Dean of Kilfenora and Provost of Kilmacduagh. Saint Mary’s Cathedral, Limerick, which is dedicated to the Blessed Virgin Mary, was founded 850 years ago in 1168 and is the oldest building in Limerick that remains in continuous daily use. But the Diocese of Limerick predates the cathedral by more than half a century. The cathedral stands on a hill on an island that is the oldest part of Limerick. This is the much older site of the former palace of the O’Brien Kings of Thomond. The palace, in turn, had been built on the site of the Viking meeting place, or Thingmote – the Vikings’ most westerly stronghold in Europe. The Thingmote had been the centre of government in the early mediaeval Viking city when it was captured by Brian Boru. The O’Briens moved their centre of power from Killaloe to Limerick. A century later, Bishop Gilbert of Limerick (1107-1140), as the Papal Legate, presided at the Synod of Ráth Breasail in 1111. The Diocese of Limerick was formally recognised at that synod, and it was agreed that Saint Mary’s Church would become the cathedral. However, building work on a new cathedral did not begin until 1168, and Donal Mór O’Brien, who was fifth in descent from Brian Boru and the last King of Munster, founded the cathedral on the site of his palace on King’s Island. 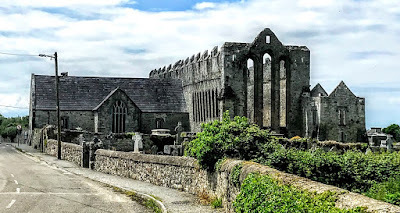 King Donal also built the cathedral on top of the Rock of Cashel in Co Tipperary, Saint Flannan’s Cathedral in Killaloe, and Holy Cross Abbey, Co Tipperary. Parts of the O’Brien palace may have been incorporated into the new cathedral in Limerick, and tradition says the Romanesque great west door was the original main entrance to the O’Brien royal palace. Most of the building work was carried out between 1180 and 1195. The cathedral was enlarged by Donat O’Brien about 1200, was completed about 1207, and was further adorned by Bishop Eustace de l’Eau (1312-1336) in the early 14th century. Saint Mary’s is 51.8 metres long from east to west, and 27.4 metres wide from north to south, measuring through the transepts. The original plan of the church was in the form of a Latin cross. Additions were made two centuries later when Stephen Wall was Bishop of Limerick (1360-1369). The tower, which was added in the 14th century, rises to 36.58 meters. The tower and stepped battlements give the cathedral the appearance of a castle from some angles. The design has strong indications of both Romanesque and Gothic styles of architecture with Romanesque arches and doorways and Gothic windows. But the cathedral is not pure in any one style, and the plan and elevation give the impression that the design was altered during the course of building. The interior of the cathedral, with its thick walls and piers supporting the wooden roof, retains many mediaeval features. The walls are relatively plain, with a rubble stone surface. Yet, despite the thickness of the walls, the cathedral is remarkably bright inside, mainly because of the larger windows inserted during various Victorian restorations. Perhaps the most famous features in Saint Mary’s are the carved misericords that were once in the choir. These misericords are unique in Ireland and are the only surviving pre-Elizabethan carvings. They probably date from 1480-1500, perhaps from the restoration work carried out by the last pre-Reformation Bishop of Limerick, John Folan (1489-1522). In the early Church, priests stood for most service, and sitting was prohibited. The lip on the edge of each of these seats allowed the clergy to rest while the seats were tipped up, so that they appeared to be standing but were allowed to sit in act of mercy – hence misericords. Of the 21 carvings, 16 are different, with mediaeval emblems such as a two-legged one-horned goat, a griffin, a sphinx, a wild boar, an angel, a head resembling Henry IV, a dragon biting its tail, antelopes with inter-twined necks, a swan, an eagle, the Lion of Judah with a dragon, as well as a human head wearing a ‘chaperon’ under the stall reserved for the Dean, a cockatrice or two-headed lizard holding its tail the Archdeacon of Limerick, a wyvern or two-legged dragon biting its tail for the Canon-Precentor, another wyvern for the Canon-Chancellor – the seat for the Canon-Treasurer is broken. The chapter once consisted of the Dean, Precentor, Chancellor, Treasurer, Archdeacon, and the 11 prebendaries of Sain Munchin, Donoghmore, Ballycahane, Kilpeacon, Tullabracky, Killeedy, Dysert, Ardcanny, Croagh, Athnett or Anhid, and Effin. At the west end of the cathedral, beside the West Door, is another unusual stall, once reserved for the Earls of Limerick who also hold the anomalous and unusual title of Prior of Limerick. The first member of the Pery family to settle in Ireland was William Pery, who died ca 1635. His descendants intermarried with the family of Edmond Sexten, Mayor of Limerick in 1535, one of the principal figures in the dissolution of the monasteries at the Reformation. In 1543, Edmund Sexten secured a royal grant of Saint Mary’s Abbey or Priory in the Englishtown of Limerick. His grandson, also Edmund Sexten (died 1637), also a Mayor of Limerick, spent much of his life fighting battles with the city corporation. He claimed immunity from the lands of two dissolved abbeys from the jurisdiction of the mayor and corporation and claimed to two votes in elections for the mayor and councillors because he was the successor to the priors of Saint Mary’s. These grants were confirmed in a royal patent in 1609. His only daughter, Susannah Sexten (died 1671), married Edmond Pery of Croom, Co Limerick (d.1655). Their son, Colonel Edmond Pery, successfully claimed the right as Prior of Saint Mary’s to have two votes in the common council of Limerick City. His descendant, Edmund Sexten Pery, was Speaker in the Irish House of Commons (1771-1785) began to lay out Newtown Pery, which forms the nucleus of the modern city of Limerick. His brother, William Cecil Pery (1721-1794) was Dean of Killaloe (1772-1780), Dean of Derry (1780-1781), Bishop of Killala (1781-1784), and Bishop of Limerick (1784-1794), as well as receiving the title of Baron Glentworth (1790). His son, Edmund Pery (1758-1844), was given the additional titles of Viscount Limerick (1800), Earl of Limerick (1803), and Baron Foxford (1815). The cathedral is entered through the south porch, with the Pery or Glentworth Chapel belonging to the family of the Earls of Limerick on the left side and on the right the Consistory Court, which was once laid out as a mediaeval hall. In the nave and aisles are several recesses, formerly endowed as chapels by powerful local families. 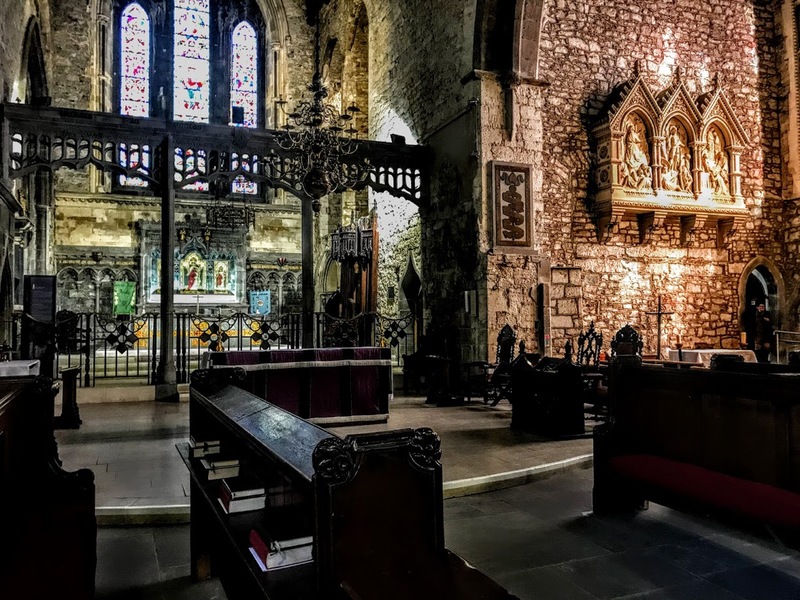 These include the O’Brien Chapel, the Jebb Chapel, the Holy Spirit Chapel, the Saint James and Saint Mary Magdalene Chapel, and the former Baptistery. The Jebb Chapel has a striking, large statue of Bishop John Jebb (1823-1833), who is regarded as a forerunner of the Oxford Movement. The Chapel of the Holy Spirit in the North Transept, has a ‘Leper’s Squint’ in the north wall. At the East End of the Cathedral, beyond the Glentworth Choir Screen, the Lady Chapel has a redredos carved in 1907 by James Pearse, father of the 1916 rebel Patrick Pearse. The altar in the Lady Chapel is 4 metres long (13 ft), weighs three tons and is the cathedral’s original, pre-Reformation High Altar from the cathedral. In 1651, after Oliver Cromwell captured Limerick, his parliamentary army used the cathedral as a stable – a fate suffered by other cathedrals during the Cromwellian campaign in Ireland. His troops also removed the altar and dumped it in the River Shannon. But it was recovered from the riverbed in the 1960s and was reinstated. The altar is carved from a single block of limestone and is said to be the largest such altar in Ireland and Britain. The beautiful pale blue frontal was woven by Anglican nuns in Dublin who were inspired by motifs in the Book of Kells. On the north side of the Lady Chapel is a large monument with effigies of Donough O’Brien, 4th Earl of Thomond, and his wife, Elizabeth FitzGerald. This monument was also badly vandalised by Cromwell’s troops. This splendid tomb is composed of three compartments, of marble of different colours, and is surrounded and supported by pillars of the Ionic, Corinthian, and Composite orders, and decorated with his arms and various trophies. Below it is the coffin lid of the founder of Saint Mary’s, Donal Mór O’Brien, who died in 1194. Like many mediaeval cathedrals and churches in Ireland, Saint Mary’s benefitted or suffered – depending on your point of view – from heavy restoration work in the Victorian era. In 1856-1863, the English architect William Slater restored the east end, adding a new east window as a memorial to Augustus O’Brien Stafford. One of the many subscribers to the window was Florence Nightingale. The Romanesque doorway at the west side is an impressive carving of chevrons and patterns, but it was severely damaged in restoration work carried out in 1895, so that only the hood and the innermost of the four orders are original. Local tradition says that during the many sieges of Limerick soldiers used the stones around the west door to sharpen their swords and arrows, and that they left the marks that can be seen in the stonework to this day. But looking down on the river from the West Door, I could understand the strategic position of this ancient building above the banks of the River Shannon. Saint Flannan’s Cathedral stands on Royal Parade in the centre of Killaloe, Co Clare, near the banks of the River Shannon and on the southern end of Lough Derg. It is one of the three cathedrals in the United Dioceses of Limerick and Killaloe. The Dean of Killaloe, the Very Revd Gary Paulsen, is also Dean of Kilfenora and both Dean and Provost of Kilmacduagh. Saint Flannan’s Cathedral has been in continuous use since the 12th century, and the cathedral dates from the transition between the Romanesque and Gothic periods car 1200. A Romanesque cathedral was built in the 1180s by Donal Mór O’Brien, who also built Saint Mary’s Cathedral, Limerick. However, this first cathedral was destroyed soon afterwards by forces under Cathal Carrach of Connaught in a revenge attack in 1185. A new cathedral in the Gothic style was completed on the same site, and the nave was completed ca 1225. The Romanesque doorway of the original cathedral is preserved in the south wall of its successor. However, the story of the Diocese of Killaloe predates the cathedral, and the story of Christianity in this area dates from a time long before modern diocesan boundaries were shaped. Killaloe takes its name from Saint Molua (554-609), who is said to have founded a monastery here in the 6th century. But the cathedral is dedicated to Saint Flannan, a member of the same family as Donal Mor O’Brien, and reputedly the first Bishop of Killaloe in 639 AD. The earlier monastic settlement founded by Saint Molua stood on a small island in the Shannon, about a half-mile downstream from the Killaloe-Ballina bridge. Later the monks moved to more spacious ground on the mainland. This monastic centre was called Cill Dálua (Killaloe), or the Church of Saint Lua. Saint Molua was born in Ardagh, Co Limerick, where the parish church is called after him. On a visit to Munster, Saint Comhghall, Abbot of Bangor, found him asleep in a field where he was tending his father’s flocks. Recognising the boy’s holiness, he took him with him to Bangor. There he studied for the religious life and was ordained a priest. Saint Molua is said to have founded monasteries in Ardagh, Co Limerick, at Killaloe, at Friars’ Island near Ardnacrusha, which was covered in 1930 by damming for the hydroelectric scheme, and at Cluain Fearta Molua (Kyle), north of Borris-in-Ossory, Co Laois, on the border of Leinster and Munster. His successor, Saint Flannan, is said to have been the son of Turlough, King of Thomond. He was also Saint Molua’s nephew and his first disciple. There is a story that one day, after he had been baking continuously for 36 hours, a heavenly light shone through the fingers of his left hand. It lit up the darkness to allow him to continue baking. On learning of this, Saint Molua decided to retire and appointed Saint Flannan as abbot in his place. Saint Flannan was noted for his hospitality and the people of Thomond agreed that he should become their bishop. He is said to have visited Rome where he was consecrated bishop by Pope John IV (640-642). However, a former diocesan historian, Father Ignatius Murphy, who died in 1993, discussed the abundance of legends about Saint Flannan. He dismissed the mediaeval life as historically valueless and said we have very little hard information about him. He argued that Saint Flannan lived in the eighth century, possibly in West Clare, and that the prominence given to him was due to family pride and propaganda on the part of the kings of the Dal gCais in the 11th and 12th centuries. There is no mention of Killaloe in the Irish annals until an ambitious Brian Boru made it the capital of his kingdom in Co Clare. Whatever the historical truth, the new kingdom needed its own patron saint, and Saint Flannan emerged to fill this need. The royal patronage of the O’Brien family ensured recognition of the new diocese at the Synod of Rath Breasail in 1111, with Máel Muire Ua Dúnáin as the first Bishop of Killaloe. To make the diocese viable it incorporated at least three, earlier separate dioceses that had been founded around three abbeys: Killaloe, under Saint Molua and Saint Flannan, Roscrea, founded by Saint Crónán, who died in 665, and Scattery Island (Inis Cathaigh), founded by Saint Senan. The cathedral was restored in the early 17th century by Bishop John Rider (1613-1632), and further restoration works were carried out in 1676 and 1707-1711. Bishop William Knox (1794-1803) continued these restoration projects. The central tower was raised in the 18th and 19th centuries when the belfry and castellations were added. The turrets and battlements were added in the 1790s and a further elevation to create the belfry was made in the 1890s. Killaloe Cathedral is a cruciform-shaped building, with an aisleless nave, transepts, chancel, and central tower. It is 47.7 metres long, 9.15 metres wide and 11.7 metres high. The 11 metre high three-light East Window contains stained glass by Warrington of London and shows Christ surrounded by his 12 disciples. The window dates from 1865 and commemorates Ludlow Tonson, 3rd Lord Riversdale, a Victorian Bishop of Killaloe (1839-1861). The chancel and the nave are divided by an elaborate Gothic oak screen, with a rose window, erected in 1885. The north transept is now used as the cathedral vestry on the ground floor, with the chapter house in the room above, and stairs that lead to the tower. Until the 19th century, the South Transept was used as the Bishop’s Court, where pleas for marriage licences were heard and penalties for many offences were pronounced. The South Transept is screened off and is now used as a side chapel and on Sunday morning for coffee after the Cathedral Eucharist. The features in the nave of the cathedral include the Romanesque doorway, the Kilfenora High Cross, a Rune Stone and a beautifully decorated stone font. The 12th century Romanesque doorway, with its richly decorated carvings, has been inserted in the south-west corner of the nave. The arch has four richly-carved orders decorated in a typical Romanesque style, with chevrons, beads, an array of animals with their tails wrapped around the hair of human heads, and fine honeysuckle ornaments. It has over 130 patterns of plants and animals, with no two alike. There are two grave slabs at the base of this decorated doorway, reputedly marking the grave of Muircheartach O’Brien, King of Munster and self-declared High King of Ireland, who died on a pilgrimage to Killaloe in 1119. He was the great-grandson of Brian Boru, and the last of his descendants to be High King of Ireland. The imposing 12 ft-high 12th century High Cross was moved from Kilfenora in north-west Co Clare to Killaloe in 1821 by Bishop Richard Mant (1820-1823), an amateur archaeologist. The cross was embedded in the walls of the Gothic cathedral in the 1930s. It is free-standing once again and stands in the nave of the cathedral. The small stone with inscriptions in Runes, a Scandinavian script, and Ogham, an old Gaelic form of lettering, was discovered 100 years ago in 1916 and dates from ca 1000. This is the only example in Ireland of a stone with both Runic and Ogham inscriptions. It may have been carved by a Viking who converted to Christianity. The Viking Runic inscription reads: Thorgrim carved this cross; the Ogham, which is on the side of the stone, reads: A blessing on Thorgrim. The rectangular stone font is elaborately decorated and dates from the 13th century. It is decorated with arabesque-style ornaments and on one side atypical cross and foliage design. The font was originally a ‘table’ or ‘polypod’ font, and would have been mounted on five legs and a plinth. These are now lost, and the font was set on its present base in 1821 by Bishop Mant, at the same time as he brought Kilfenora High Cross to Killaloe. On the north side of the cathedral is a small 11th century oratory or chapel that predates the cathedral. 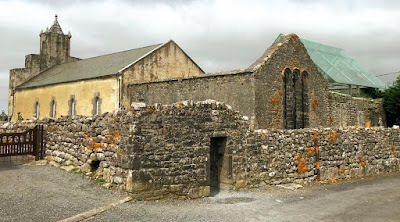 Saint Flannan’s may have been the original sanctuary of the holy abbot. Its roof is very steep, and made entirely of stone. It has a belfry, and two doorways to the east and west. The oratory is one of a small number of Irish churches with a stone roof and is possibly the oldest surviving church in Ireland built in the Romanesque style. The cathedral tower houses a chime of eight bells which are rung every Sunday and regularly throughout the week. The chime of bells was installed in 1869 and was cast by M. Byrne of Saint James’s Street, Dublin. The cathedral organ, with a staggering total of almost 1,500 pipes, is by Nicholson and Lord of Worcester and dates from 1900. It was restored 50 years ago in 1966, and again in 2001-2002. A £200,000 restoration project including the repair of the Romanesque doorway and the reconstruction of the Kilfenora High Cross, was completed in 2001. The cathedral is normally open from about 9 am until 6 pm, or until dusk in winter. There are Sunday services at 11.30 am every week. The Holy Communion is celebrated on the second and third Wednesday of each month at 10.30 am, and on saints’ days. The bells are rung every Sunday, and tours of the tower are available by prior arrangement. Saint Brendan’s Cathedral, Clonfert, Co Galway, is the cathedral of the Diocese of Clonfert, now part of the Dioceses of Limerick and Killaloe. 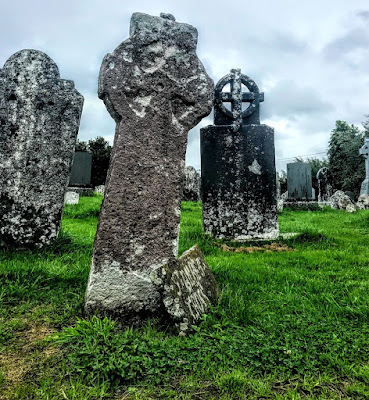 It is difficult to find the way there and the signposts to Clonfert are totally inadequate for an important site in Irish architectural and ecclesiastical heritage. Apart from the cathedral, there is nothing in Clonfert that testifies to its fame and reputation in the past. 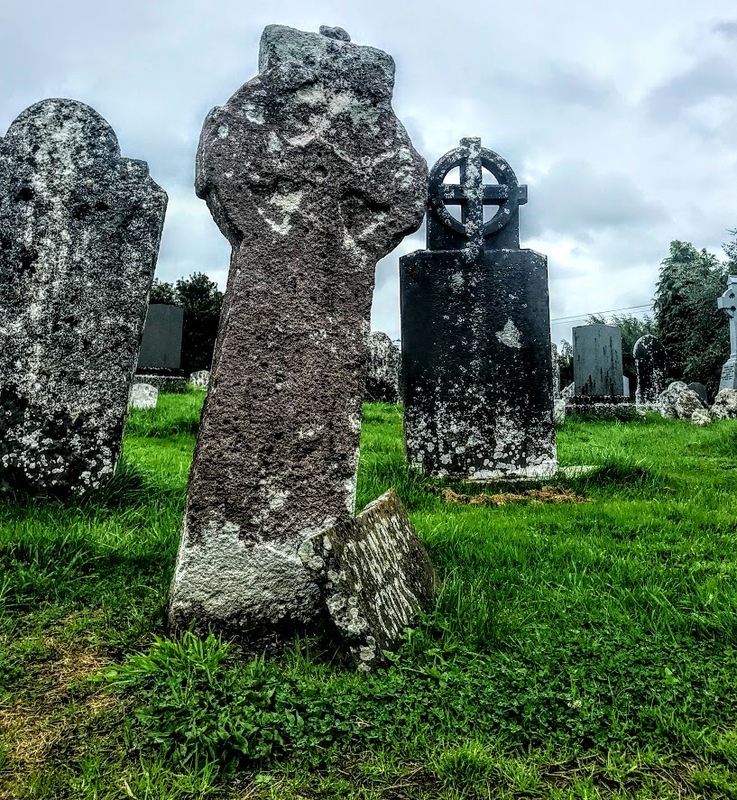 Some say this was once a city with a celebrated school and more than 3,000 learned monks, and that it was the site of a proposed university; today, Clonfert is little more than a townland. The cathedral stands in the grounds of the monastery founded in the year 563 by Saint Brendan the Navigator, who is said to be buried in Clonfert. His monastery flourished for many centuries, even through times of great Viking raids – it was burnt down in 1016, 1164, and again in 1179. Despite these raids, Clonfert was one of Ireland’s great monastic schools and it became the launching pad for some of some of the great Irish missionary endeavours in Europe. Despite its early foundations, the earliest part of the cathedral dates from around 1180, and most authorities now agree that the present building dates from the close of the 12th century when the church was rebuilt as a small Romanesque Cathedral. There is hardly a square inch of this unique doorway where the sculptor’s tool has not been at work. The variety of animals’ heads would suggest Scandinavian and Norman-French influences. Above the doorway, a pointed hood encloses triangles alternating with bizarre human heads, and below is an arcade enclosing more human heads. During 15th century restoration work, the present Gothic chancel arch took the place of the original transitional arch and the Gothic windows were inserted in the chancel walls. This 15th century chancel arch is decorated with angels, a rosette and on the south side with a bare-breasted mermaid carrying a mirror and combing her hair – a reminder of the story that Saint Brendan, on one of his voyages, preached to the creatures of the sea. On the opposite side of the arch is a Celtic sculpture showing a Celtic knot like an anchor chain. The supporting arches of the tower at the west end of the church are also decorated with 15th century heads, and the innermost order of the Romanesque doorway was also inserted at this time. The sacristy also dates from the 15th century. Other features include the cathedral’s large 15th century carved stone font and a number of gravestones, some with marks of great antiquity and one bearing Celtic lettering in Latin across a Celtic cross. Originally there were two transepts; the Romanesque south transept has long been in ruins and is roofless, while the north transept has disappeared altogether. After the Caroline restoration, the cathedral was restored by Bishop Edward Wolley in 1664. The bishop’s throne of carved oak recalls Bishop Matthew Young, Bishop of Clonfert 1799-1800. The figures in the carved oak pulpit represent the Four Evangelists; the Communion Rail commemorates Queen Victoria’s diamond jubilee; four stained glass windows in the chancel represent the Four Evangelists, a pair of stained glass windows represents Saint Peter and Saint Paul, a two-light window portrays King David and King Solomon, and a single-light window represents the Good Shepherd. Clonfert Cathedral was included in the 2000 World Monuments’ Watch by the World Monuments’ Fund, which says the soft sandstone structure had weathered severely, and prior conservation efforts, which did not fully address all the building’s problems, as well as substantial biological growth, have compounded the deterioration. Saint Brendan’s Cathedral, Ardfert, Co Kerry, the seat of the Diocese of Ardfert from 1117, was destroyed by fire in 1641. Saint Brendan is said to have founded a monastery at Ardfert in the sixth century. Although the Synod of Ráth Breasail in 1111 had designated Ratass Church, near Tralee, as the cathedral for a diocese in Kerry, it was moved to Ardfert by 1117. The diocese later renamed Ardfert and Aghadoe, although it is not clear whether Aghadoe was ever a separate diocese with its own cathedral. The site at Ardfert, near Tralee, has three mediaeval church ruins, the main and earliest building dating from the 12th century. In the churchyard are two other churches, Temple Na Hoe dating from the 12th century and Temple Na Griffin dating from the 15th century. The main church has an ogham stone and a number of early Christian and mediaeval grave slabs. In the 15th century, a small transept was added and battlements were built. The cathedral roof was destroyed during the 1641 Rebellion, but the south transept was re-roofed and extended later in the 17th century. The Diocese of Ardfert and Aghadoe was united with the Diocese of Limerick from 1663 and the former cathedral became a parish church. A new Church of Ireland parish church opened in 1871, when the cathedral’s roof was removed again. With the disestablishment of the Church of Ireland that year, Ardfert Cathedral was among the disused historic sites transferred to what is now the Office of Public Works. Part of the transept has been restored, and houses the entrance and a gift shop. The church ruins at Aghadoe overlook the Lakes of Killarney and stand less than 5 km north-west of Killarney, Co Kerry. Aghadoe may have been the site of a church as early as the seventh century, but the surviving remains of a stone structure date from the 11th and 12th centuries. The site has also been associated with the fifth century missionary Saint Abban, but seventh century ogham stones are the first evidence of Aghadoe being used as a church site. According to legend, Saint Finian founded a monastery at Aghadoe in the sixth or seventh century. The first written record of a monastery dates from 939 AD in the Annals of Innisfallen, which refer to Aghadoe as the ‘Old Abbey.’ The O Dononoghue clan tried to forcible move the centre of the diocese in Kerry from Ardfert to Agahadoe in 1158, but this was a military and political disaster, and there is no historical reason to refer to the ruins at Aghadoe as a cathedral. Aghadoe served as a parish church and the archdeacon was the rector. The annals record that the High Cross of Aghadoe was blown down by a strong wind in 1282. The town of Aghadoe was sacked by Cromwellian forces in the 1650s forces. By 1740, Aghadoe was no longer listed as an active parish and had ceased to function. Saint Ailbe, the first abbot, was buried in the abbey. His successors obtained many privileges for the inhabitants. The monastery at Emly became the seat of the Diocese of Emly in 1111 at the Synod of Ráth Breasail, and Emly was the metropolitan see for the Province of Munster until it was supplanted by Cashel in 1152 at the Synod of Kells. The last Bishop of Emly, Raymund de Burgh, died in 1562, and the see remained vacant until 1568, when Emly was united the Diocese of Cashel. The cathedral was rebuilt in 1611-1615. But the cathedral was abandoned in 1821, and services were then held in the rectory until a new cathedral was built by the Pain brothers in 1824-1827. In the 19th century, the cathedral still had a full panoply of chapter members, including a Dean, Precentor, Chancellor, Treasurer, Archdeacon and four prebendaries (Dollardstown, Killenellick, Doon and Lattin). The cathedral was dismantled in 1877, and part of the stonework was used to build a new church at Monard. Saint Fachan’s Cathedral, Kilfenora, is in the Burren in Co Clare, about 28 km from Ennis and 15 km from Ennistymon. Saint Fachan founded a church at Kilfenora in the sixth century. The first stone church was burned down in 1055 by Murchad O'Brien.It was rebuilt in 1056-1058, was plundered in 1079 and was destroyed by an accidental fire in 1100. In 1152, the Synod of Kells established the Diocese of Kilfenora, corresponding to the ancient territory of Corcomroe, although a bishop is not recorded until 1189. The present cathedral dates from 1189-1200. It was built in the so-called transitional style with a nave and a chancel. The nave and chancel in the cathedral were later separated and by 1839, ‘36 feet of the east end’ were roofless. The diocese was one of the poorest in Ireland, with only 13 parishes. In the Church of Ireland, Kilfenora was merged in turn with the Diocese of Limerick (1606-1607), the Diocese of Tuam (1617-1742), Clonfert (1742-1752), Killaloe (1752-1976) and again with Limerick (since 1976). The Dean of Kilfenora is also the Provost of Kilmacduagh. The ruins of Saint Colman’s Cathedral, Kilmacduagh, are about 6 km south-west of Gort, Co Galway, beside a 34 metre tall round tower. The monastery was founded by Saint Colman in the seventh century, and the cathedral dates from the 11th and 12th centuries. The Diocese of Kilmacduagh was established at the Synod of Kells in 1152. The cathedral had fallen into ruins in by the mid-16th century. In the Church of Ireland, the Diocese of Kilmacduagh was united with Clonfert in 1625. Under the Church Temporalities (Ireland) Act 1833, the united see became part of the Diocese of Killaloe and Clonfert in 1834. Since 1976, Kilmacduagh has been part of the Diocese of Limerick and Killaloe. The Dean of Kilfenora is also the Provost of Kilmacduagh. In the Roman Catholic Church, Kilmacduagh continued as a separate diocese until 1750, when Pope Benedict XIV decreed that it to be united with Kilfenora. Since Kilmacduagh was in the ecclesiastical province of Tuam and Kilfenora was in the Province of Cashel, it was arranged that the ordinary of the united dioceses was to be alternately bishop of one diocese and apostolic administrator of the other. The first holder of this unusual arrangement was Peter Kilkelly. In 1883, Kilmacduagh was united with Galway. Since that date, Kilfenora has been administered by the Bishop of Galway as Apostolic Vicar, directly under the Pope. Updated: 23 July 2018 (with image of Kilfenora Cathedral and link to posting on Kilfenora Cathedral); 24 September 2018 (with image from the site of Emly Cathedral and link to posting on Emly Cathedral).